Low-Fat Spinach Artichoke Dip - Eat. Drink. Love. I’m a big fan of spinach artichoke dip, but let’s face it, it’s not the healthiest appetizer/snack choice. Most of the spinach artichoke dips you get at restaurants are made with heavy cream and full-fat cream cheese. I’ve come up with a low-fat, guilt-free version that you can make and enjoy at home! I use this little guy for baking mine. It takes a bit longer to get the dip cooked/heated, but what I like about it is that it keeps the dip consistently warm. If you don’t have a mini Crock-Pot, no worries! You can still bake this dip in a small baking dish in your oven! Serve this dip with your favorite crackers, pita chips, or fresh veggies! – 2 8-ounce packages reduced-fat (or fat free!) cream cheese, softened. 1. If using the oven, preheat to 350 degrees. In a food processor, blend cream cheese, Parmesan cheese, garlic powder, and salt until smooth and creamy. Add spinach and blend until thoroughly mixed. Add artichokes and coarsely chop until desired consistency is reached. Add to stoneware or shallow baking dish. 2. If using the mini Crock-Pot, cook for 1 1/2 hours. Sprinkle Monterey Jack or mozzarella cheese on top during the last 10 minutes. If you are going to bake the dip in your oven, sprinkle with cheese and bake for approximately 15 minutes (the edges of your dip may turn a light golden brown). NICE….and guess what?! I have a mini crock pot! This is one of my favorite go-to appetizers that I’ve given up recently! 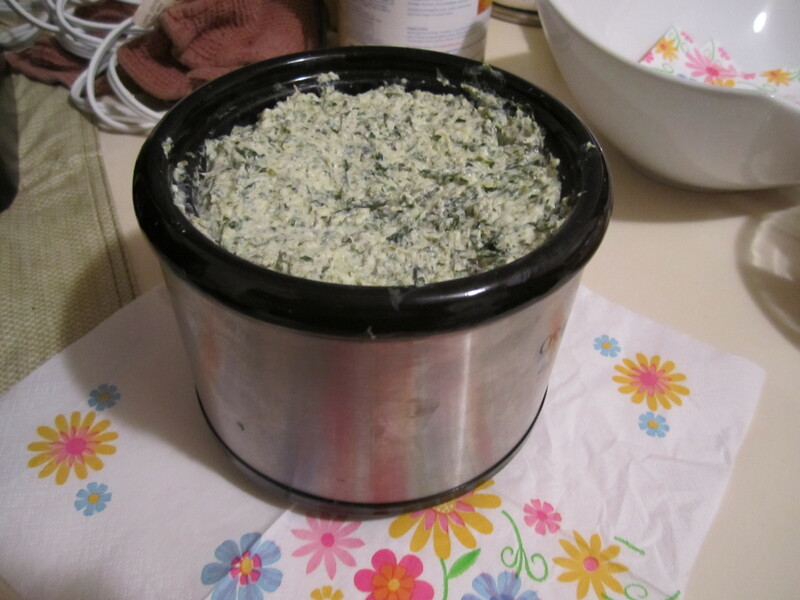 Pingback: Flashback Friday: Low-Fat Spinach Artichoke Dip - Eat. Drink. Love.